The SR Series Bench Scale is an ideal tool for shipping departments, mailing services, storage companies, laundry facilities and other businesses needing a compact and reliable scale for their business. The SR Series Bench Scale is a great addition to just about any business. Built to last, our scale features an AC adapter and built-in rechargeable battery with an auto power-off function to save power. An extended spiral cable attaches the indicator to the scale so the easy to read display can be placed where you need it for easy visibility. The SR Series scale has a capacity of 100 lbs and is precise to .02 lbs – this gives the scale the precision you need to help maximize your profits. With a footprint of only 10" x 13", this powerful scale meets the needs of your business while requiring minimal space. 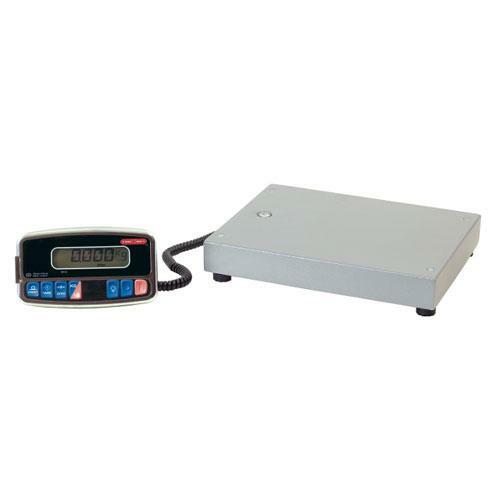 With an easy to clean steel casing, the SR Series scale features an indicator/display with a built-in serial port for easy PC/printer communication. Attractively designed and tough enough for everyday professional use, this scale will help meet virtually every weighing need for your business. Whether you’re weighing a package in a mailing service or preparing a box for shipment, the SR Series Bench Scale will be an invaluable tool for your business. So if you need a dependable and affordable scale, choose the SR Series from TOR REY.